One of the oldest hotels in Dublin, The Castle Hotel has operated since 1809. Housed in an elegant Georgian building lovingly restored, the hotel retains many of its original features - period staircases, crystal chandeliers, stucco plasterwork and open fires in the winter. The Castle provides a friendly, family-run environment, a home from home at a modest cost for the tourist and business traveller alike. The bedrooms at The Castle are individually decorated to make the most of their spacious Georgian elegance. All rooms are fully en suite with TV, direct dial telephone and tea and coffee making facilities. Iron, ironing board and hairdryers are available from reception. Other facilities available at the hotel are a babysitting service and a private car park (for which a nightly fee is charged). The John Ensor bar, located on the ground floor of the hotel, provides guests with an intimate setting in which to get away from the throng. The hotel's central location enures that there are also a wide range of excellent restaurants and bars, to suit all budgets, within easy walking distance. 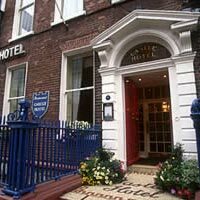 The hotel is located off Parnell Square at the end of O'Connell Street, Dublin's main street. The Gate Theatre, The Writers Museum, the James Joyce Centre and the Hugh Lane Gallery are all just minutes away, while a ten minute walk will bring you to Temple Bar and Trinity College.